Bali Traditional Tour Luh Luhwih is female Gamelan music dance group. A Gamelan is a traditional musical ensemble from Indonesia. It is the main element of the Indonesian traditional music. Each Gamelan is slightly different from the other. Mysterious and elegant sound is highlight. 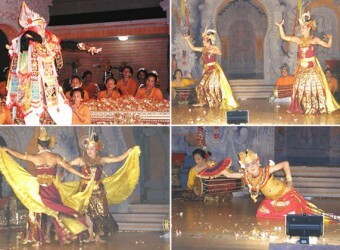 The performance on the stage was played only by women. It was a gorgeous impressed stage performance. The fluttering costume clothes were very beautiful.